This is the training model of the Hoverpod, given to new Arkadia colonists as part of their early missions. Note: The specs for the Hoverpod have been slightly adjusted. It now offers less armor protection but increased speed to 55.8 km/h. Fuel consumption remains unchanged. 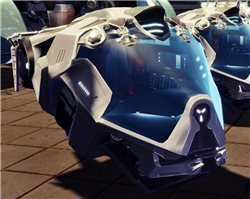 The mission to obtain the Hoverpod is still part of the Arkadia starter mission chain.